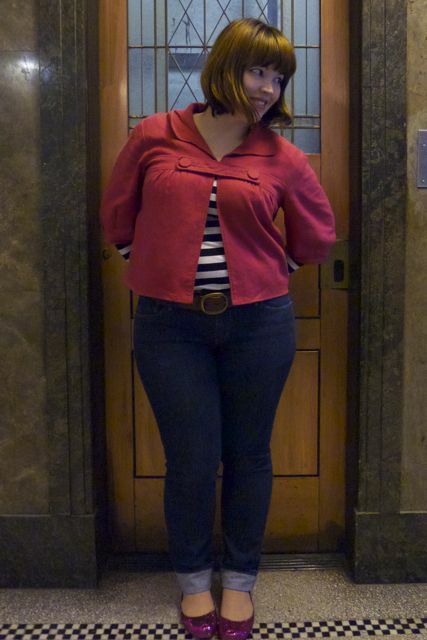 Yeah, so I built this outfit around the shoes, what of it? They’re hot pink, plastic and glittery, and wholeheartedly deserve to have an outfit built up around them. The Sophisticate had to work today, so I took the opportunity to do some window shopping, and apart from leaving a trail of glitter these held up well. People keep asking me if my feet getting sweaty and uncomfortable in Melissa shoes, and the answer is surprisingly “no”. Apparently authentic Melissa shoes are made out of some kind of high-tech “breathable” PVC – I’m not sure how legit that is, but I can honestly say I’ve never personally had a problem, and I’m on my feet pretty constantly. 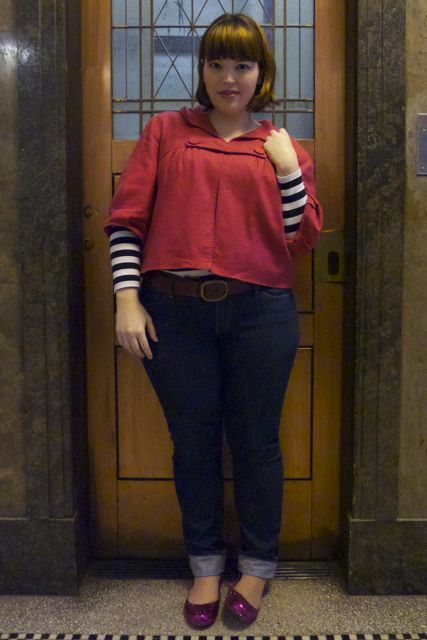 This entry was posted in Uncategorized and tagged cold, glassons, jeans, levi, melissa, sussan by lillipilli. Bookmark the permalink. Eeeek-pink glitter shoes!!! How exciting!!! These are adorable-def worthy of having an outfit built round them!!! Also love the cute pink jacket! Thanks! I had a quiet “squee” when I saw them! Very cute shoes! I imagine that, in terms of feel, they might be a bit like wearing some of the crocs shoes…..just much, much, much prettier. On the Melissa website it says they’re only available up to a size 34? whoa..I love these shoes. They are exactly what a girl needs to cheer herself in this gloomy weather. I am also loving your Sussan’s jacket. Thanks Bella! They’re pretty special. 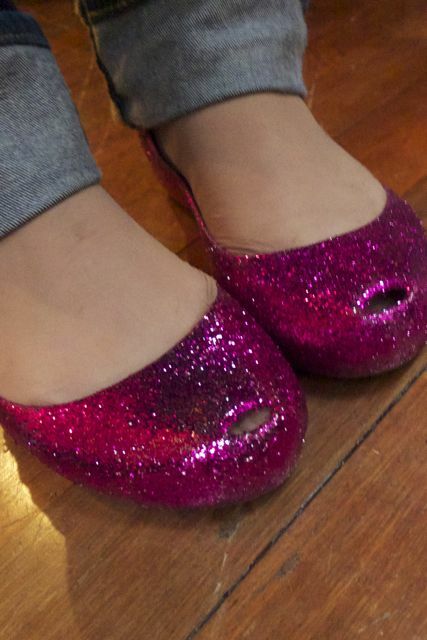 My eight-year old self (lover of all things pink and glittery) would DIE for these shoes! Wow, wow, wow! Loved the entire outfit! 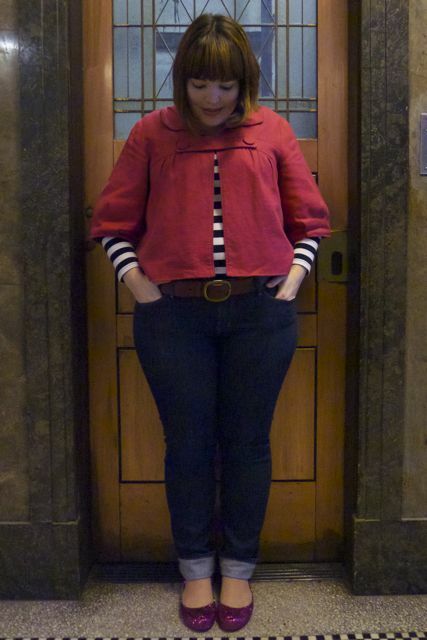 That jacket is amazing and paired with the stripes if just stunning. The shoes are rockin’ too!! You look beautiful!